Gabriela P erdomo ‘20, a student from San Juan, Puerto Rico, reflects on her decision to fly the nest and land on Hawk Hill. As a high school student, it was daunting to think about choosing a new school and community to call home. Luckily, deciding to become a Hawk at Saint Joseph’s University was one of the best decisions I have ever made. Living in San Juan, Puerto Rico, I was told from a very young age I would study in the United States after high school. Since I have been in the same school for 14 years, leaving my island for good always seemed to be in the distant future. 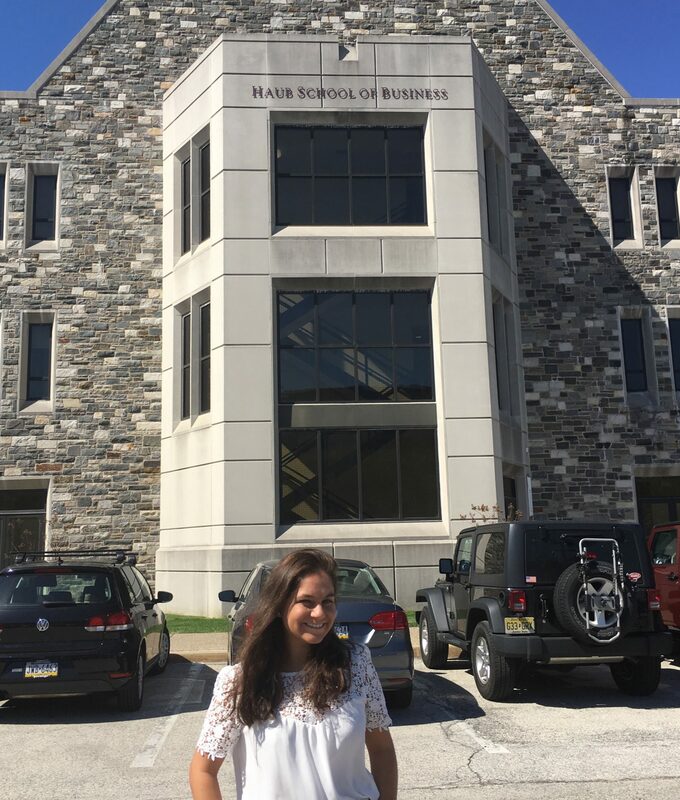 The first of three times I visited Saint Joseph’s was on my birthday and since then, I could not get that beautiful campus out of my mind. It wasn’t until I was sharing a Philly cheesesteak with my mom at Larry’s Steaks after my last tour of SJU that I could truly begin picturing my life on Hawk Hill. Later that week during breakfast, my parents were skimming the brochures of the two possible universities I would attend. In that moment, I stood up and announced that I had chosen SJU. Both of them proceeded to cry from happiness and from that moment on, a calm rushed over me. I knew I had chosen the right school. My first semester of college seemed overwhelming at first, but I tried to find my place amidst a large group of unique individuals. I always approached my classmates and floor mates with a positive attitude and I attended anything and everything I was invited to. One of the great things about SJU is the endless opportunities and clubs that are offered. Although I had not yet taken my first Food Marketing course, attending multiple presentations from local food companies and all the free food made me fall in love with the major a bit more. I also joined the International Business Society after finding my International Business freshman year seminar with Dr. Neiva so engaging. Within this club, I attended presentations and conferences with companies that emphasized international associations with other businesses, something that really appealed to me. Before I knew it, it was December and I had the bittersweet task of leaving this new place that I had called home for many months. One of my favorite memories of my fall semester was finals week because although there was a lack of sleep and stress was in the air, everyone came together and helped each other like I had never seen before. So many of my friends helped one another understand the material until they were confident enough to move on to the next concepts. I found that whether a student is a friend of yours or not, everyone is so helpful and wants to see you succeed. I remember spending three days straight in the same library classroom with the same six people, and some new faces here and there, trying to break down a whole semester of Accounting 101 in just three days. If it weren’t for the time I spent in that classroom and the people who helped me, I would not have taken that exam as confidently as I did. Upon my return to Puerto Rico after my first semester, I immediately missed everything and everyone at SJU. I anticipated my return in January by counting down the days and keeping in touch with my friends so I wouldn’t feel so far away from them. Once I returned to SJU, I felt at home again. In the spring semester, I rushed Delta Sigma Pi, a co-ed business fraternity. Through my eight intense weeks as a pledge, I was challenged to present myself professionally, plan various engaging events for the brothers, learn how to balance my time between my fraternity friends and my other friends but most importantly, I learned how to work alongside a group of 16 other freshmen who to this day, I call my second family. Lunch dates in Campion and late-night library runs were never the same. Those tiring eight weeks helped shape the person I am today for the better. It introduced me to some of the best and I cannot imagine my SJU experience without them. Pledging DSP was the best decision I made during my spring semester and if I could, I would do it all over again. Reflecting on my first year, I learned to appreciate everything more. I was grateful for my time at home on the beach with my family. I also enjoyed my time at SJU through hosting multiple Sunday night movie sessions with my future roommates, exploring Philadelphia on the weekends, as well as all the endless hours spent in the library with my DSP family. I was amazed at how I could meet a new person each day and I have never laughed harder and felt happier than I have in my time on Hawk Hill. 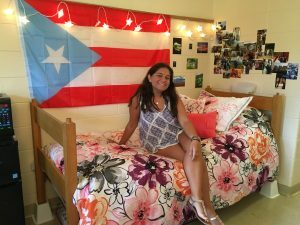 Gabriela Perdomo ‘20 is from San Juan, Puerto Rico. 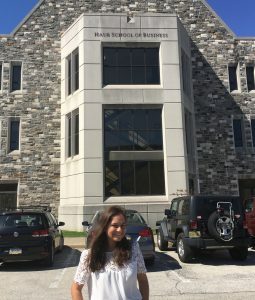 At Saint Joseph’s, she is a member of the co-ed business fraternity Delta Sigma Pi (DSP) and studies Food Marketing and Leadership, Ethics and Organizational Behavior (LEO).